Any and every dentist will tell you that dental care is important, though they may not explain exactly why. Oral health is connected to your overall health and making sure you take care of your mouth and teeth is very important. It may seem like a nuisance to brush your teeth twice a day, once in the morning and once at night before bed. You may be tempted to skip it every once and while, but honestly, you really shouldn’t. It’s important to brush your teeth in the morning because plaque forms during the night while you are not using your mouth to eat, drink or talk. A buildup of plaque left unaddressed can lead to tartar which can only be removed by scraping your teeth, which is done by a dentist. Brushing at night helps release bacteria from food that you have eaten during the day and leaves your mouth feeling fresh and clean. Many dentists also encourage you to brush your teeth within 30 minutes of eating to reduce the amount of bacterial colonization of the teeth. Bacteria can lead to tooth decay which leads to much discomfort and a fairly hefty dental bill. You may not have the opportunity to brush after every meal but brushing twice a day is better than not at all. Arguably even more inconvenient than brushing your teeth is getting into a routine of flossing each night. It is well worth it though. Flossing at least once a day will remove food particles and plaque that accumulate between teeth during the day. Just brushing may loosen and remove some of this, but not all. There is a reason your dentist asks you every visit if you have been flossing. They know if you lie. The last step in your daily oral hygiene routine should be using mouth wash to rinse your mouth. Mouthwash has numerous benefits including leaving your breath minty and fresh, as well as protecting against the buildup of plaque and preventing gingivitis. Gingivitis is an early-stage gum disease that you do not want to risk developing. Some mouthwashes contain ingredients to aid in the whitening of teeth, which is always a plus. Regular visits to your dentist are crucial to your oral health. 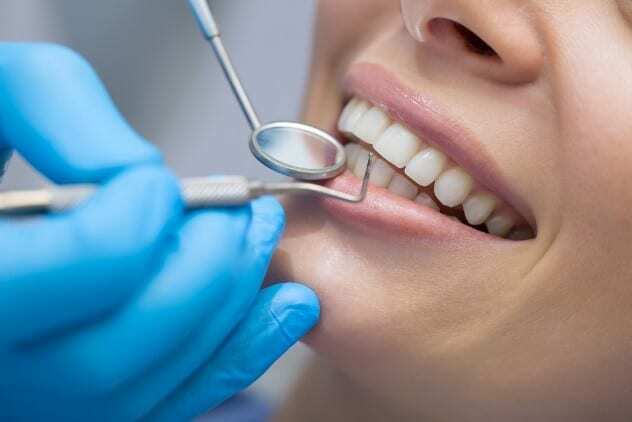 A typical dental checkup involves checking for cavities, removing plaque and tartar buildup and assessing your overall oral health. Sometimes plaque develops into tartar which can only be removed by the scraping that your dentist performs. Your dentist is also highly educated and can easily spot the early signs of oral cancer, which when addressed early on, can be treated and more likely prevented. There are some things that go unnoticed by an untrained eye, so your 6-month visits to the dentist increase the chance of catching anything going wrong early on. In addition to examining your oral health, your dentist will also check your neck, jaw and lymph nodes for any swelling, lumps or other abnormalities. These can all be signs of major health issues which your dentist will alert you of and refer you to the proper medical professional. Avoiding major oral health issues is easy if you visit your dentist on a regular basis and maintain a daily routine of brushing, flossing, and mouthwash between visits. Schedule an appointment with Boston Dental today by calling our Government Center Dentists at 617.402.5000 or our Downtown Crossing Dentists at 617.338.5000.